A highly functional mannequin that can give birth. Now, that is something I had never heard of before. 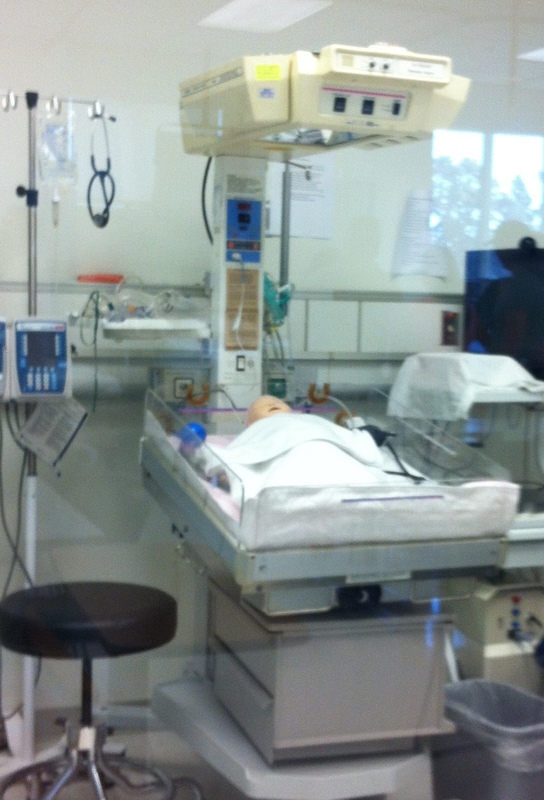 I am in a Simulation Lab in Santa Rosa, at my boyfriend’s nursing school. One of the instructors is telling us about a hi-tech dummy that can simulate many of the symptoms of pregnancy and child-birth and can actually give birth. I look forward to seeing this modern dummy, but when we are taken to see it, it is behind locked doors and we are only allowed to peek through the large glass windows. In the same room is another functional dummy, a much smaller one. It can simulate ailments common among children. As we walk around on this family night tour of the nursing school facilities, we discover another room with a very realistic looking mannequin. It’s a man who can fake many illnesses and can even talk. The microphone is manipulated by the instructor. Again, the access to the room is closed. 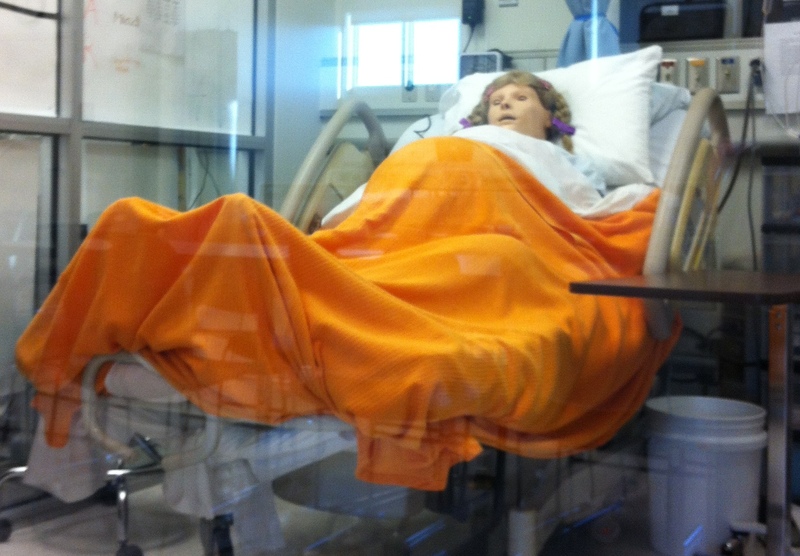 These dummies cost thousands of dollars and even nursing students are only allowed regulated access to them. The students use these to practice and fine-tune their newly acquired skills. When we moved from San Francisco to Santa Rosa, I was prepared for a change in lifestyle and in being a supportive partner to my boyfriend as he transitions from technology to a career as a registered nurse. I had expected a vicarious experience of nursing school but this intriguing peek into his new life opened up another world. I want to get a closer look, to experience the high-tech human persona of these dummies. Unfortunately, my boyfriend will not have access to these precious commodities until later this semester. I’m looking forward to a vicarious experience of these human-like creatures. I hope they don’t disappoint. The car in front, on the left side of the street is flashing its headlights. The woman on the sidewalk is saying something. It is chaotic. I am confused. Crazy people, I think, as I make a right turn. The car with the flashing lights must be trying to pick up the woman, I assume, and they are both trying to get each others attention. Just as I turn right, happy to get away from the chaos, her words and the flashing lights suddenly form a clearer picture. They were trying to tell me that I was going the wrong way on a one way street. My decision to turn right is the right response albeit unintentional. I am the crazy one. The one way sign was blocked by a van that was parked on the corner of Valencia and 15th in San Francisco. I lived in this neighborhood for ten years and walked around the streets hundreds of times. I thought I knew the streets. The roaring tiger, in the mural on the side of the Peruvian restaurant Pica Pica, always wakes me up. It’s at the corner where I had turned into the one way street. The van is blocking the mural also. I am driving because I don’t live in the neighborhood anymore. My mission is to eat at Pica Pica. I love their Arepa and am excited to experience it again tonight. I find parking within five minutes of my blunder, on the same one-way street but this time I am headed in the right direction. As I walk down 15th street towards Pica Pica, I am reminded of how easy it is to walk in San Francisco even late at night. I love the flowers and fauna of Santa Rosa, where I now live. But those can only be enjoyed during the day. At night, my Santa Rosa neighborhood is dark and quiet and easy to get lost in since the streets are not arranged in a grid. At night, I am lost in the streets of my old neighborhood when I am in a car. At night, I am lost in the streets of my new neighborhood when I’m on foot.